I like this word. I might just be the queen of expectation. I like a plan. I like to know what's on tap for today, next week, this summer, the retirement years-ha! As a mother and a teacher I was intentional in setting clear expectations for my daughters (and my students), because I think children typically do better if they know what's expected. I guess I'm like a kid that way. I like knowing what's next. I like making lists and checking them off. I can live quite comfortably with a full calendar and a busy schedule, with people coming and going and all sorts of travel and crazy, if I know to expect full-busy-and a-little-bit-crazy. Recently we've had to make some significant changes to our summer calendar and plans due to unexpected family illness. We've preemptively canceled some of what we were expecting to happen in order to be present in what is actually happening. We need blank space in our lives right now that will allow us to come and go as needed, to rest and recharge, and to tend to whatever needs tending. We're told to live one day at a time, but do we really do that? Don't we more often attempt to outrun unwanted change, avoid difficult circumstances, plan and plot so there are no interruptions or detours in the way we think life should go? How we expect it to go? Raising my hand here. Our pastor in his message this morning (don't you love when that happens?!) reminded us that nothing is unexpected in God's eyes. Nothing surprises Him. He knows what was, and is, and is to come, and He is sovereign over every last bit of it. I'm thinking it's a pretty good plan. I like your plan of trusting Him and taking it one day at a time. Like you, I am a planner at heart and enjoy making lists of things as well. I get happy when I cross items off my lists. Perhaps that is part of being a writer. I loved your post. Happy Sunday! Oh, Joyce, I'm the same way. I love a plan, and I love working by a plan. But, you are so right, life happens and often unexpectedly. I am so sorry for the family illness you referred to. May the Lord surround you with his peace and comfort during this time. I'm thankful that "nothing is unexpected in God's eyes. 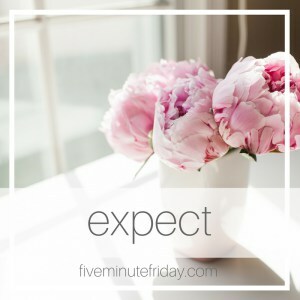 I'm your neighbor on Five Minute Friday this week and thought I'd stop by to say hello! I'm a middle aged mom of 2 lovely daughters as well! Love this! I tend to fall into the over-planning trap. You can expect that my prayers continue for your family member and for all of you! I am also a list maker and get kind of off-kilter when "it" isn't on the list. I get what you are saying. Excellent plan. Praying for your family illness. I believe in making plans, but I'm okay with going with the flow when plans change. Well, at least most of the time. Oh my hand is waving around frantically as well. How I love a plan, a list, an agenda, and a purpose. But very little goes as planned as we very well know. So we rearrange, detour, and bend as life happens. Praying you feel peace as God leads you through this situation that is going on, and rejoicing with you that NOTHING is unexpected in His eyes! I too have been a planner, an agenda and list maker, then health issues interrupted it. Not what I expected either. Now I plan for what I expect to accomplish, or go, or do, then learned to accept what God actually let play out. Adjusting, adapting, and being flexible helped with expectations of my own or others. I stopped this evening by to catch up with you. As always, I enjoyed your post. I'm a planner, too. Praying that everything works out regarding that family illness. Oh, I get you! I don't do well with unexpected changes. I've had lots of those in my life. May God be close to you as you deal with family illness--that can be so difficult for those of us who like to know what's next! This right here? "We've preemptively canceled some of what we were expecting to happen in order to be present in what is actually happening. We need blank space in our lives right now that will allow us to come and go as needed, to rest and recharge, and to tend to whatever needs tending." Wisdom. Thank you for the reminder that we need to not just make room in the moment, but also in the upcoming moments for resting and refreshing during the stressful seasons. I'm praying for your family, Joyce. I am one who has to know what is going to happen and when and with whom it is going to happen. I don't like surprises. They freak with my head. Like I always say, "I don't know what tomorrow holds, but I know Who holds tomorrow." I know whatever surprises come my way, He has it under control. I hope that your family member is going to be just fine. You're all in my prayers. I like the way you expressed our plans vs. God's plan. That has been my experience in the hard things in life. What your pastor says has been a comfort to me as I have realized also through my experiences that God is always ahead of me. He goes before me. He makes a way. He will see you through. That is great advice "Trust Him. Take one day at a time." Oh yes...we all love to have a plan, don't we? I am learning more and more everyday that it's OK to have your own plan but keep in mind that God has his too. I want what I want but if it's not in God's plan for me, I just cannot push ahead with my own agenda unless He lets me know that I am to do it. I must have peace about a decision. You are a smart woman, Joyce...a beautiful post. Just know that I'm praying for you!! My daughter says that phrase that Suzanne quoted, "I don't know what the future holds, but I know Who hold the future".